In the applet below, a triangle is shown. 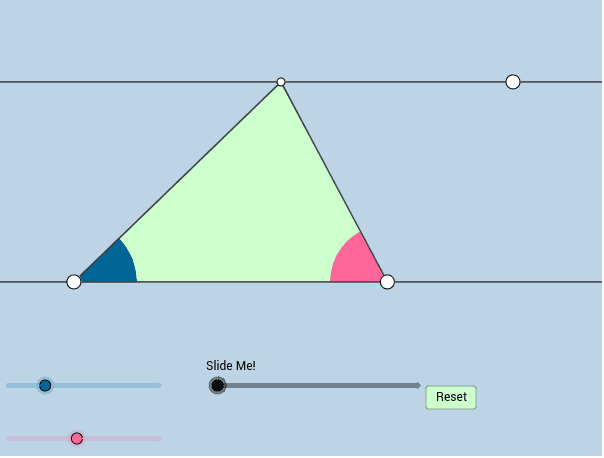 You can change the sizes of the blue angle and pink angle by using the sliders in the lower-left corner. You can also move the white points anywhere you'd like at any time. Interact with the applet below for a few minutes. Then answer the questions that follow. Area of a Triangle = ? In this applet's dynamics, the triangle was transformed into another figure. What kind of figure is it? How does the applet imply your classification is correct? How does the area of the newer figure compare with the area of the original triangle? How does the BASE of the newer figure compare with the BASE of the original triangle? How does the HEIGHT of the newer figure compare with the HEIGHT of the original triangle? Given your responses to (1) - (4) above, describe how you can find the area of ANY TRIANGLE.